Winter Formal is this Saturday. Winter Formal is coming up this Saturday from 7:30 to 11pm at the Natural History Museum in Balboa Park. There will be three floors and the rooftop available to explore with many exhibits open. 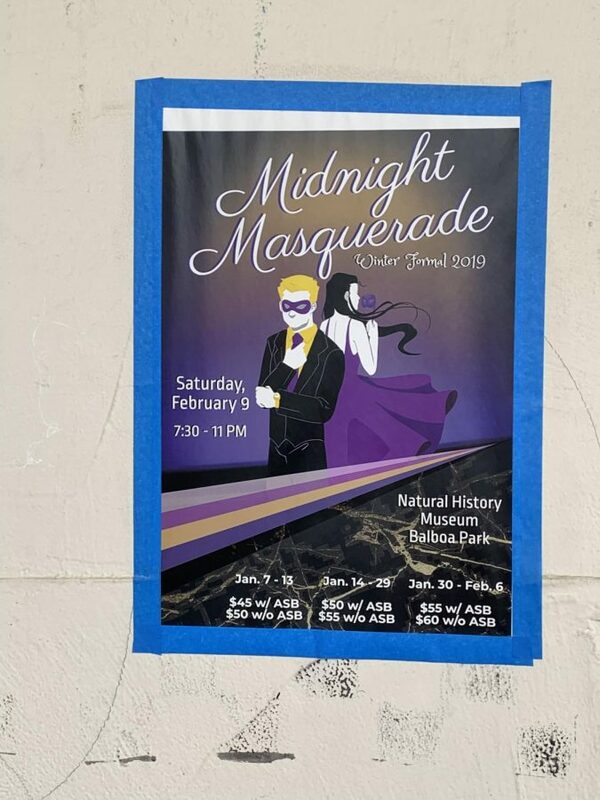 This year’s theme will be “Midnight Masquerade,” which allows everyone to disguise themselves for an exciting night. According to ASB teacher Rod Keillor, there will be a DJ, some dancing, food, beverages, and a chocolate fountain on the first floor. On the second floor there will be open museum exhibits, casino games, and silent disco. The third floor will have open exhibits and leads up to the rooftop, which will include an Italian soda bar, lounging area, and live music performances from SDA musicians such as the Chalk Talk band. There will be complimentary flip-flops at coat check for anyone who needs a break from their shoes, and free masks on some of the tables for those who did not bring one. The last day to buy tickets is Wednesday. Go to the finances office or the SDA Webstore to buy your tickets for $55 with ASB sticker and $60 without. For entry into the dance, you must remove your mask briefly and present your student ID. The entrance to the dance will be on the north side of the museum.